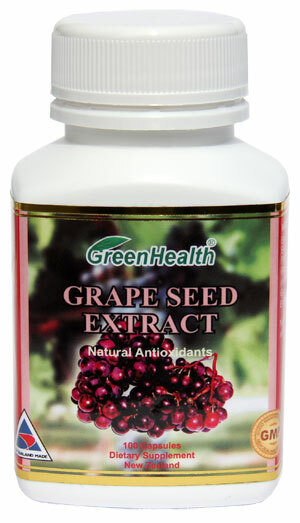 Green Health Grape Seed Extract is a potent antioxidant. Antioxidants can be beneficial for protecting against premature aging and degenerative diseases caused by free radical damage. Each capsule contains Grape Seed 20000mg(as equiv to dry seed) with hyper 95% OPC Polyphenols, Grape seed Oil 200mg. No artificial flavorings, preservatives, sugar, salt, starch, corn, yeast added. No artificial colourings within capsules, except capsules shell. The antioxidant capacity of grape seed extract comes from proanthocyanidins (oligomeric proanthocyanidins) (OPCs). Scientific studies have shown that proanthocyanidins antioxidant power is 20 times stronger than Vitamin C and 50 times stronger than Vitamin E. If you have any doubts about the powerful effects of Anti-Oxidants, a recent study showed that the risk of developing cancer is 11.4 times greater for those with low levels of Anti-Oxidants. Grape Seed Extract has been researched in a large number of clinical trials.